White Cap is a pale fungus and alchemy reagent. It can be found growing in all zones, except for the very first zone of your Alliance. 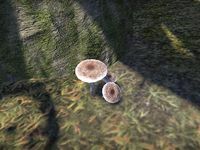 Like the other mushrooms, it tends to grow at the base of trees and around rocks, not in open spaces. Prior to Update 10, White Cap's fourth trait was Uncertainty (then known as Lower Spell Crit). This was changed to Detection to avoid a quadruple match, which was not supported by the game. This page was last modified on 26 June 2018, at 00:34.